Whether your company is small or in the Fortune 500, affiliate marketing programs are a valuable means for attracting new business and retaining existing customers. Affiliate marketing has taken the digital media world by storm. Even Amazon, the definitive Internet retailer, maintains a powerful affiliate marketing program all its own. There are a number of programs out there that your business can benefit from, and just as many strategies for running them. How Does One Build a Successful Affiliate Marketing Program? The management is the secret sauce in affiliate marketing. A manager should operate very efficiently, stay in the loop on the latest developments in the field, and should be willing to try experiments and take calculated risks. They are able implement their knowledge and get good ideas from others, but can also benefit from the mentorship of others who are more experienced. Networking is also very important here. Not only should an affiliate manager be constantly looking for and appraising potential marketing partners, but he or she should network with others in the field to promote a healthy exchange of ideas. This is how one’s partnerships remain vital and effective. How Does a Manager Maintain a Successful Affiliate Program? Affiliate program managers need to perpetually balance merchant needs with affiliate partner needs. Does the affiliate’s ad need to be redesigned to better match a partner’s updated site? Does the partner’s commission need to be altered in order to compensate for a change in the merchant’s revenue? These are realistic scenarios that ought to be met quickly and fairly. The most successful affiliate program managers are communicative, accessible, and fair. They respond to queries of interest within 24 hours, and are constantly updating a database of partners, coupons, and deals. They adopt an honest approach when it comes to solving problems, fixing as many of them as possible while being upfront and truthful about the situation. A good first step: make sure your manager includes his or her contact information in every email! Send newsletters on a regular basis. Give your affiliate partners lots of information about your products and how they might best help sell it. You might incentivize a deeper level of involvement from them by rewarding them for any extra effort they might put into helping sell your products. Keep their motivation up! At the same time, remember to be respectful and acknowledge that they might also also want their own time and space to meet their own goals. Find worthwhile content sites, like blogs and news outlets. The traffic that comes through them ought to be of a demographic interested in your products. It is imperative that you keep looking for new sites that might be related to the products you sell. Keep your affiliate ads clean and low-impact. 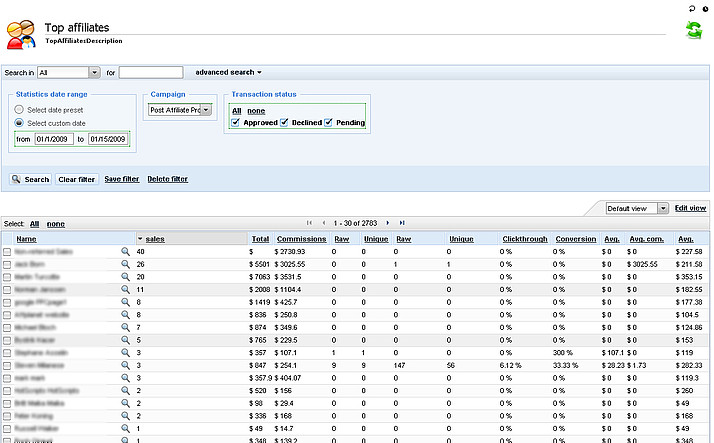 Remove extra toolbars, control coupon sites, and manage paid searches closely. Clean and stylish is always better than bulky and cumbersome. Make your ads something that your partners are proud to host on their pages. Track your sales and know how much you plan to make before negotiating with the affiliates and setting a commission. Exercise vigilance and common sense. Track your customers from the time they enter your site to the time they purchase an item. This will give you a better sense of how customers interact with your storefront while helping prevent any problems that might appear along the way. Know where the affiliates are advertising your products in order to avoid confusion and the clash of keywords and copyrights. You ought to attach yourself to a large affiliate network that will see you benefit from the large number of partners already participating in it. Try networks like LinkShare or ShareASale. Where Do You Find New Affiliates? Once you have decided on an affiliate program, the next step is recruit more partners into the network. Reach out to them directly, offering them appealing benefits to make yourself an attractive business partner, and be prepared to follow through on them. Advertise on Google, Facebook, and Bing—branch out as far as possible and try to engage a diverse range of people. Make sure that your management strategy is efficient and is actually helping grow the affiliate program. Keep motivating your affiliates by giving them bonus incentives and better payouts for sales. Avoid being cheap with them—offer your business partners generous deals that you’d want for yourself. Interact with them on a personal level and maintain friendly relations with them, as you would with any employee or business partner. Provide them with resources and information relevant to your products. Keep building new strategies and entertain new ideas. Don’t be afraid to spend money to grow your affiliate program even bigger. Don’t be afraid to cut ties with problematic partners. Emphasize the terms and conditions to them and lay down the law when necessary to avoid time wasters and fraudulent people. Make sure you choose the right affiliates who are willing to work hard for you, and diversify the affiliates so that you can reach out to more people. Work on the coupon sites, as they are very important in bringing in new customers. And finally, keep testing out new ideas, even if they sound risky—just be sure to have a backup plan in case things go south. Ready to start your own affiliate program? Ecwid has basic built-in affiliate features that can help you to integrate your store with affiliate management software to build a powerful marketing tool. We often recommend using Post Affiliate Pro—it’s quite powerful and easy to use. Ecwid supports two types integration with Post Affiliate Pro. With the first, you provide your affiliates with special links or banners that point to your store, tracking incoming clicks and sales. The second allows your partners to place your entire Ecwid store on their sites and track sales there. Affiliate marketing is a powerful means to grow your business beyond what you thought possible, and Ecwid makes it easy! Learn more about Ecwid and Post Affiliate Pro integration.